A microtiter plate was coated overnight with various antigens at a concentration of 5 μg/ml. After washing and blocking with PBST+5% BSA, detection was performed using HRP conjugated Human Anti-Pembrolizumab Antibody, clone AbD30689_hIgG1 (HCA298) at a concentration of 2 μg/ml in HISPEC Assay Diluent (BUF049A) followed by QuantaBlu Fluorogenic Peroxidase Substrate. A microtiter plate was coated overnight with pembrolizumab or human IgG4-Pro, human PD-1, nivolumab, natalizumab or trastuzumab at a concentration of 5 µg/ml. After washing and blocking with PBST+5% BSA, detection was performed using HRP conjugated Human Anti-Pembrolizumab Antibody, clone AbD30689_hIgG1 (HCA298) titrated to the given concentrations in HISPEC Assay Diluent (BUF049A) and QuantaBlu Fluorogenic Peroxidase Substrate. Data are shown as the mean of three measurements. A microtiter plate was coated overnight with pembrolizumab at a concentration of 1 µg/ml. 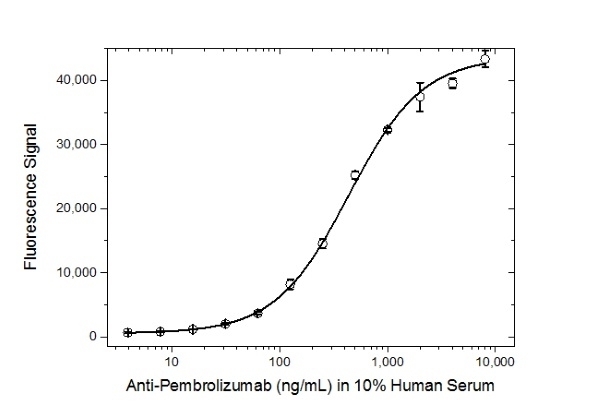 After washing and blocking with PBST+5% BSA, 10% human serum was added spiked with increasing concentrations of Human Anti-Pembrolizumab Antibody, clone AbD30689_hIgG1 (HCA298). Detection was performed using HRP conjugated pembrolizumab followed by QuantaBlu Fluorogenic Peroxidase Substrate. HRP conjugation of the pembrolizumab used in this assay was performed using a LYNX Rapid HRP Conjugation Kit (LNK002P). Data are shown as the mean of three measurements. A microtiter plate was coated overnight with recombinant human PD-1 at a concentration of 1 µg/ml. After washing and blocking with PBST+5% BSA, a pre-incubated mixture of pembrolizumab (0.3 µg/ml), spiked with increasing concentrations of Human Anti-Pembrolizumab Antibody, clone AbD30689 (HCA296) was added; HCA296 is the same clone as HCA298, but in monovalent Fab format. 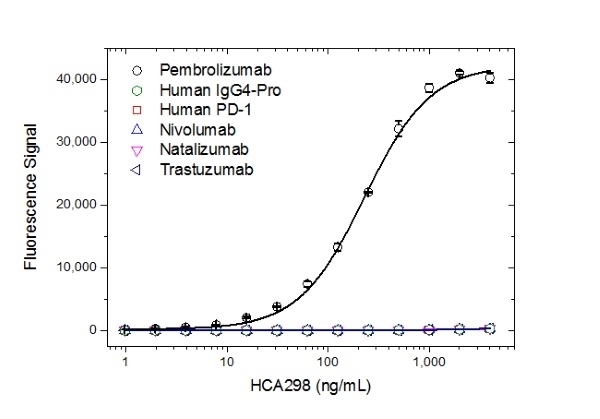 Free pembrolizumab, still capable of binding to the human PD-1 coated plate, was detected using a Mouse Anti-Human IgG (Fc) CH2 Domain:HRP Antibody (MCA647P) followed by QuantaBlu Fluorogenic Peroxidase Substrate. Data are shown as the mean of three measurements. Human Anti-Pembrolizumab Antibody is a recombinant, inhibitory, anti-idiotypic antibody in IgG1 format for use in immunogenicity testing. It can be used as a calibrator in an anti-drug antibody assay. Human Anti-Pembrolizumab Antibody, clone AbD30689_hIgG1 is a paratope specific, inhibitory anti-idiotypic antibody that specifically recognizes the free humanized monoclonal antibody pembrolizumab. 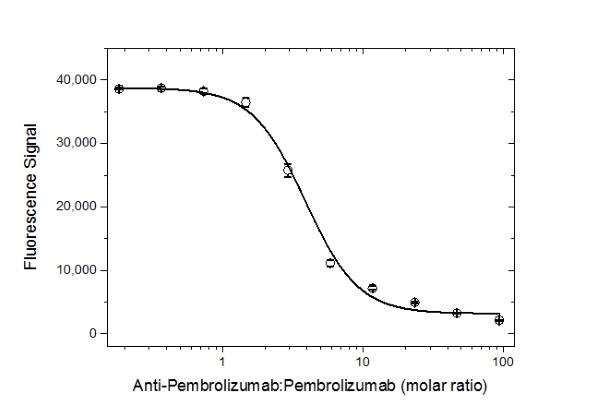 The antibody does not recognize recombinant human programmed cell death 1 (PD-1) or pembrolizumab in complex with recombinant human PD-1 and can be used to measure free pembrolizumab levels in serum from patients. Clone AbD30689_hIgG1 is a fully human recombinant monoclonal antibody with IgG1 isotype and is suitable as a reference standard in an anti-drug antibody (ADA) assay. Pembrolizumab (Keytruda) is a humanized (IgG4/kappa) antibody with the heavy chain mutation S228P (IgG4-Pro). Pembrolizumab is used to treat inoperable or metastatic melanoma, metastatic non-small cell lung cancer (NSCLC), and as a second-line treatment for head and neck squamous cell carcinoma (HNSCC). For NSCLC, pembrolizumab is a first line treatment if the cancer overexpresses PDL1 and has no mutations in EGFR or ALK. Pembrolizumab is a checkpoint inhibitor and acts as an immunomodulator by blocking ligand activation of PD-1 receptor on T cells, thereby activating T cells to attack the cancer. It blocks PD-1 interaction with PD-1 ligand (PD-L1) and PD-1 ligand 2 (PD-L2). The monovalent intrinsic affinity of AbD30689_hIgG1 was measured as KD = 0.6 nM by real time, label free molecular interaction analysis on immobilized pembrolizumab. Sold under license of U.S. Patents 6753136, 7785859 and 8273688 and corresponding patents. This antibody was developed by Bio-Rad, Zeppelinstr. 4, 82178 Puchheim, Germany. Keytruda is a trademark of Merck & Co.
Clone AbD30689_hIgG1 can be used in a direct or indirect ELISA or as a detection antibody for pembrolizumab. It may also be used as a surrogate positive control to generate a standard curve for an anti-drug antibody assay.